It may be easy to think that Capri is solely about the ultimate seduction, a haven for indulgence, opulence, and above all, romance. However, being my stubborn self, I sought to find out if it could also have a space for cheapskate solo backpackers like moi. 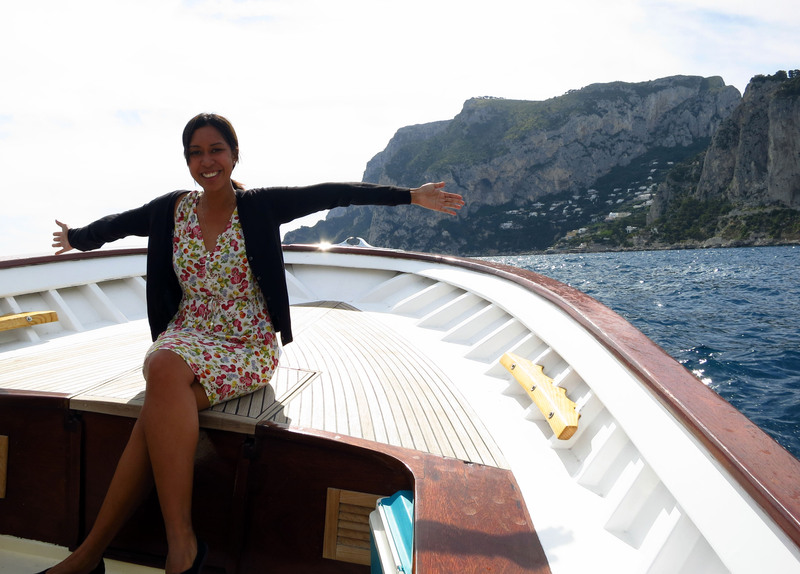 After leaving my beloved Atrani, I hopped on the earliest ferry to Capri. During the boat ride, I looked at the seats in front of me. Couple. Beside me? Couple. Behind me? Yup, couples on a double date. When we docked, couples shuffled out one after the other. Maybe this was going to be more challenging than I thought. For starters, though, I did find the one inn in the town of Anacapri that offered a dorm for solo travelers, which gave me a spark of hope. The directions given to me for Hotel Bussola sounded a bit challenging at first, but it was actually nice that it was tucked in behind the winding streets near the Sofia Church, where life goes on as normal for the residents (well, as normal as it can be in an isle of luxury). I would say that it was one of the plusher accommodations I’ve ever had on any backpacking trip. Their ‘dorm’ was actually a family suite with 4 very comfy beds, and the classy bathroom was definitely a win. Ryan and CJ, buddy backpackers from the US, just about finished setting down their packs in the suite when I got there, and they were are as thirsty as me to find adventure in Campania’s gem. 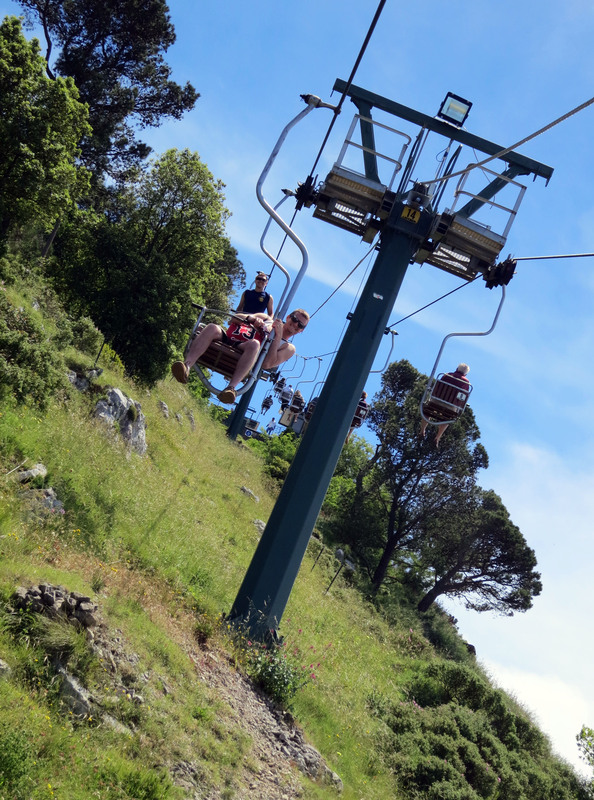 First on our hit-list was the chairlift ride up to Monte Solaro, Capri’s highest point. As we were hoisted up, our feet dangled over a lush carpet of green shrubs and gardens. Once at the top though, we were embraced by the never-ending blue of the sea and sky. At the summit, a fence keeps the curious toddlers safe from getting too close to the cliffs. It doesn’t do much for persistent backpackers (read: that’s us) though, who’ll jump over the fence and skeedadle to the edges in search of the best vistas. If windy rides up in wire chairs aren’t your thing, another option is to hike up to the summit. 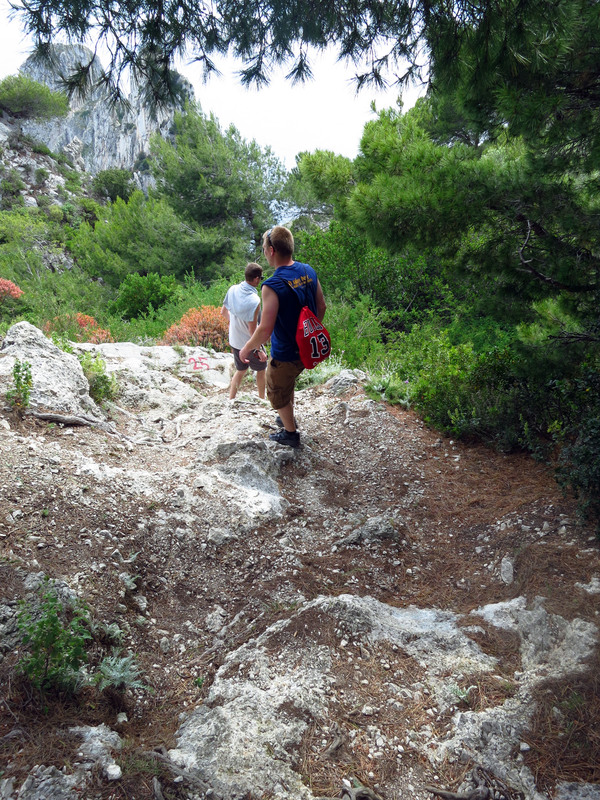 Although, be warned, we did meet one out-of-breath lady at the top who told us all about her near-death experience of hugging the rocks and jumping over gaps along the cliff-face while clambering up. After that, Ryan, CJ and I unanimously agreed to take the chairlift on the way down. 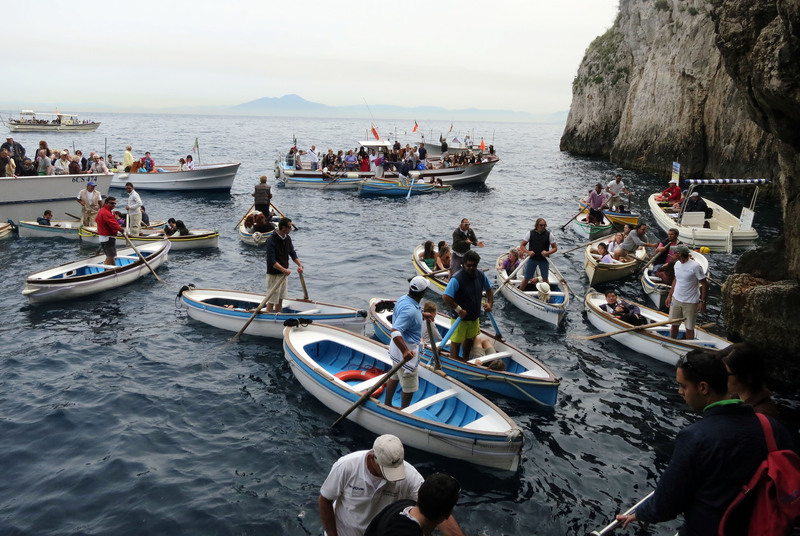 The el-cheapo way of getting around the island is by bus; however, when got off the lifts, we were greeted by a very long queue for the ride to Capri Town. A moment later, someone tapped our shoulders and asked if we’d like to split the 20-euro cab fare instead. We shot one look at the fancy top-down taxi that would cruise us to town, and said, “Hell yeah!”. Wind in my hair, sunshine on my face, amazing panoramas all around — thus began my day posing as a wealthy jetsetter (try it, it’s fun!). The piazza at Capri Town was our jump-off point for a trek. 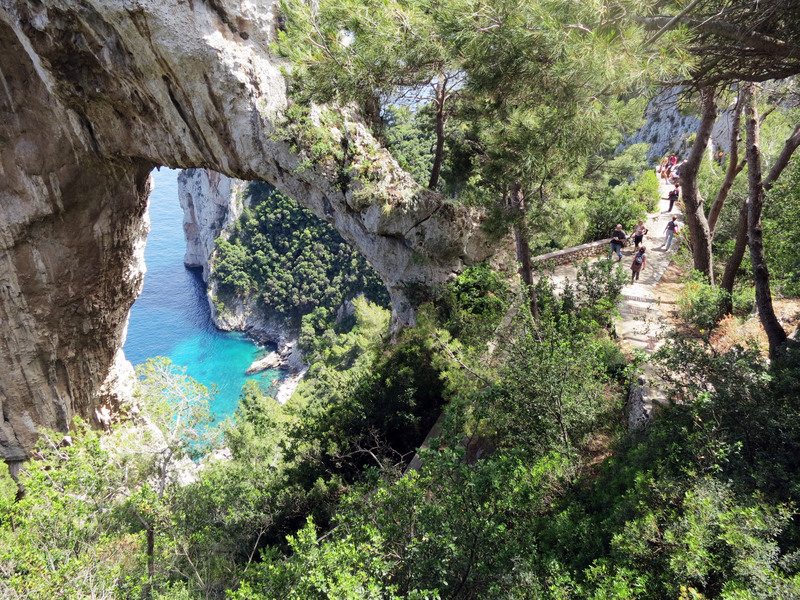 I was expecting more forest trails, to be honest, but as we walked from Via Vittorio Emanuele heading towards the Arco Naturale, it was more like taking a peek at the gates of Capri’s row of vacation homes. Finally, the concrete path opened up to greener canopies and dirt trails, and we were happy to literally get off the beaten track. Soon enough, we descended onto a rocky beach, where the road ended with either having an expensive beer at exclusive restaurant A, or having the same expensive beer at restaurant B. We went with restaurant B, which didn’t charge an entrance fee. And this is how you enjoy a beer after a trek. Dreading the hike up, we decided to whisk ourselves off to our next stop in style — in a fancy speedboat, of course! 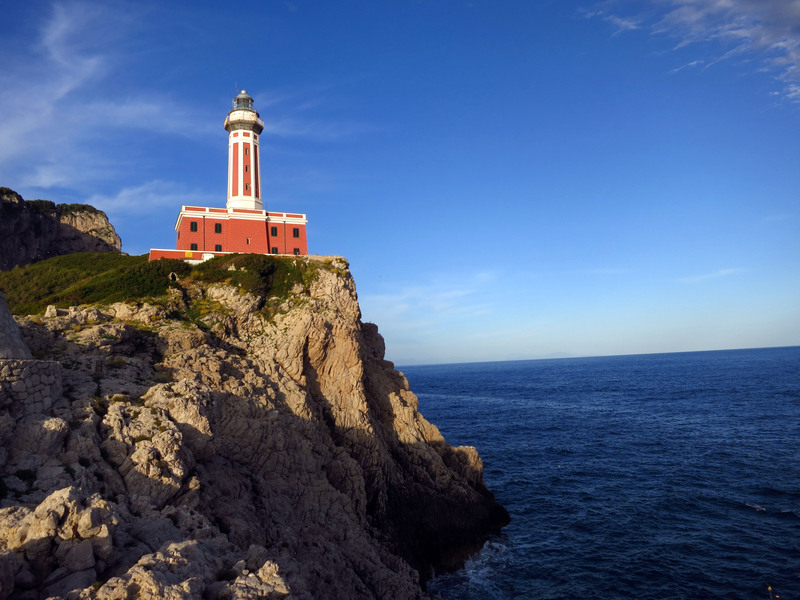 We were tipped off that the best spot to view the sunset in Capri was by the lighthouse at Faro, which was around 15 minutes by bus from Anacapri. 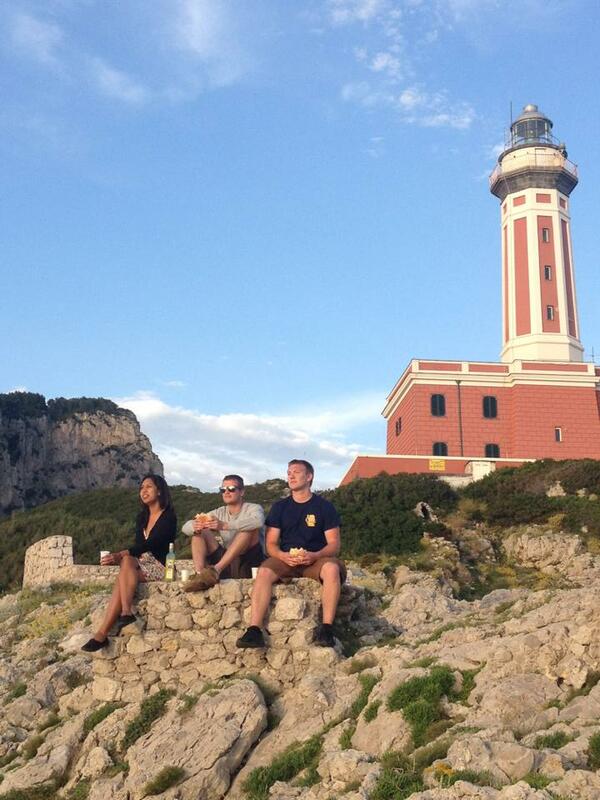 Quickly grabbing a few sandwiches and drinks, we hauled our gullible asses off to Faro. 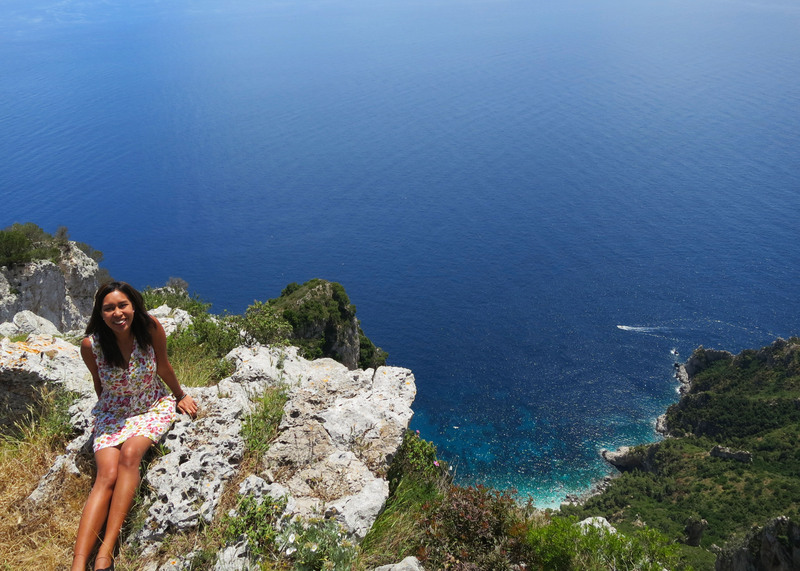 And I’m glad we did: that serene moment when we propped ourselves on the bluff, sipping on limoncello as we watched the sun disappear behind the clouds and sea — that was probably my favorite out of all the things I got to do in Capri. That moment when you feel everything’s right in the world. Oh yeah, that bit about the entangled legs. 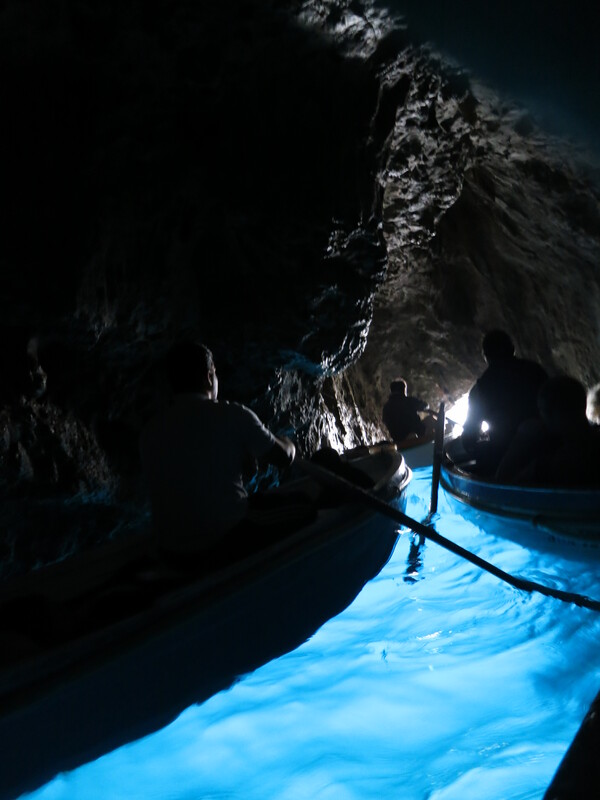 When I first learned about Capri, I read about its Grotta Azzurra (Blue Grotto), and I knew at once that I just had to see its almost-mystical glistening water. I blitzed to the cove first thing the next morning, hoping to come before the place gets swamped with tour groups. Luckily, I didn’t have to wait long before our designated boatman fetched us from the dock. Take note that the way into the grotto is through a very narrow opening. In the interest of not knocking your head against the arched entrance while the boat bobs up and down, everyone (including the boatman!) would need to lie down on the tiny rowboat. 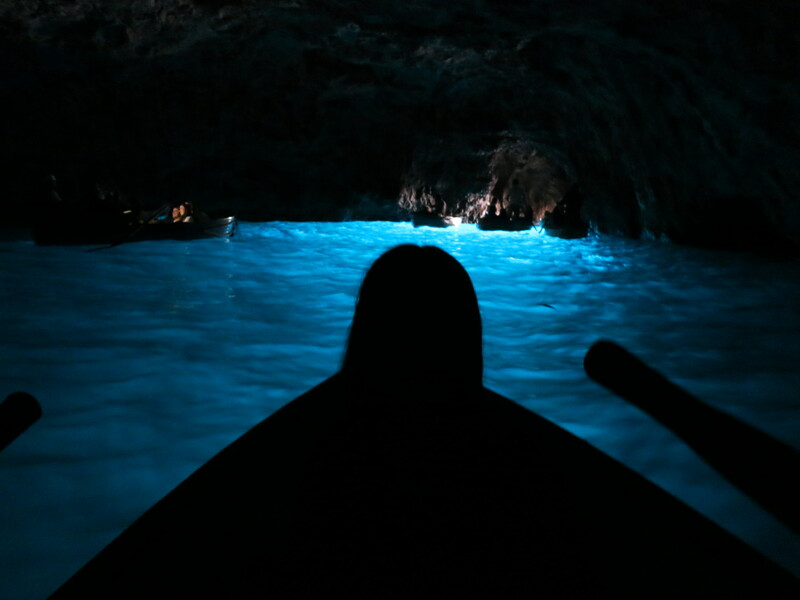 There I was, shoulder-to-knee-to-buttcheek with two fellow tourists I’ve barely said hello to, as our boatman laid down and pulled against a rope to shotgun us into the cave. Waa-lah, we’re inside! Although the gleaming water was almost ethereal, as with any other “die-die-must-try” sight, I found that the ride was too hurried, not enough for you to get fully into the moment. And no, they don’t allow visitors to jump into the water anymore, which was a big shame. One good thing that came out from riding all these public buses was that I got to see several interesting shops and cafes along the way. Eating near the piazza was pricey, but if you’d just wander off a bit, you’ll find yourself in a mom & pop place like this one, where I’m currently stuffing myself with my 2-euro panini and beer, as I take time to jot down my thoughts. 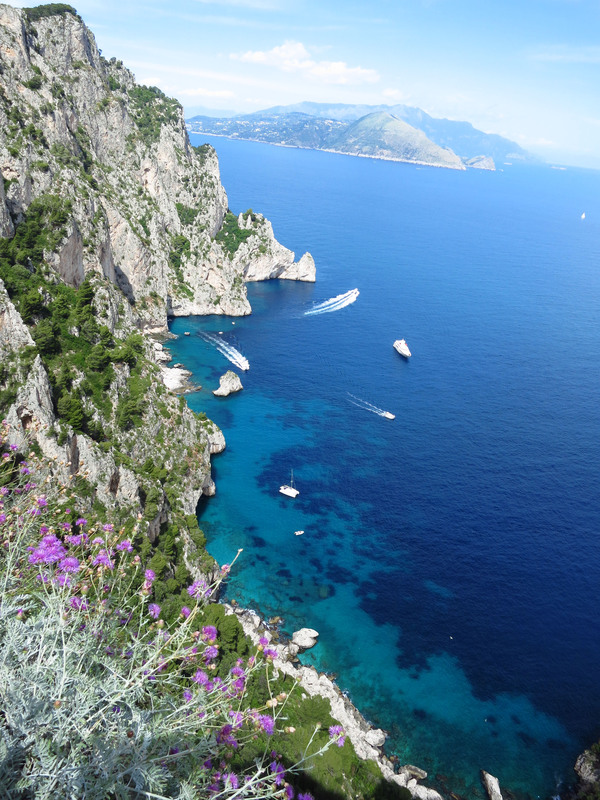 All in all, I found that penny-pinching backpackers like me could survive Capri’s embrace, as long as you have the kookiness to venture out for the equally-magnificent experiences that don’t have to cost a lot. 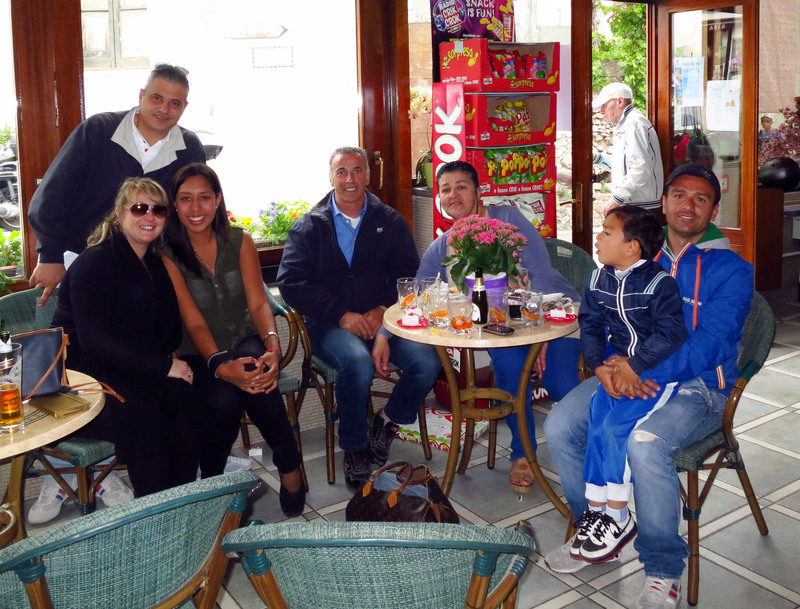 The cafe was filled with lively Italian chatter, as one table debates the football match on TV, and in another, a family celebrates their son’s birthday over aperitif. Here I was, happily scribbling away, when the family next to me caught my eye and asked where I was from. Next thing I know, they bought me another beer and we were quickly wrapped up in stories about their own adventures in Asia, how their grandson is growing up fast, and how we’re going to have our next meal together when they drop by Singapore the following year. 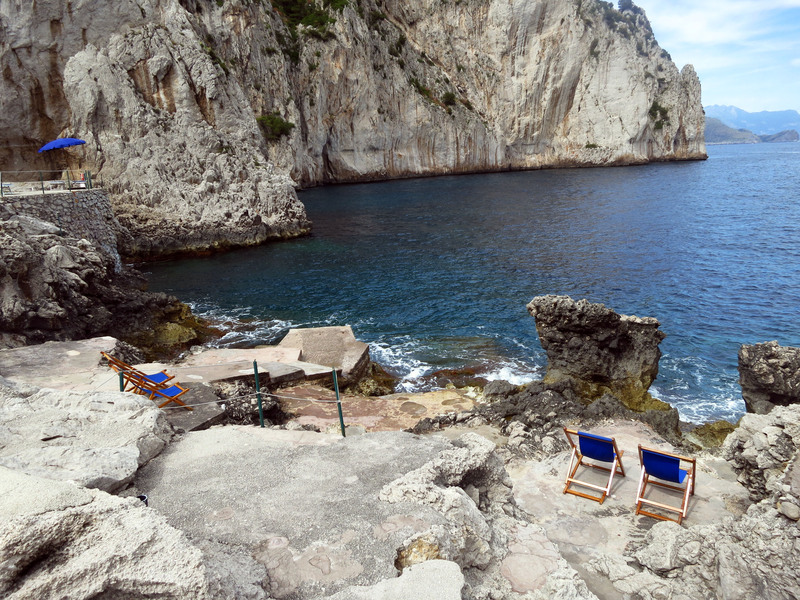 Have I mentioned how I love Capri? Indeed, in this isle, I arrived as a party of one, but somehow Capri made sure I never felt alone. Perhaps I found the magic of Capri after all. A perfect ending for my visit to Capri. Saw lovely sights, met even lovelier people. Your trip was very much like ours a few years ago and we had a great time! And, by he way, we did climb up Mt Solano and it was a very pleasant stroll. Like you, we took the chairlift back down. Thanks for dropping by, Beth and Joe! It’s a shame that I didn’t get to see the mountain trail for myself; I guess the lady we met veered off to a more exciting path. 🙂 Have fun in your adventures!